This is a feline-themed video slot with 5 reels and 20 paylines. 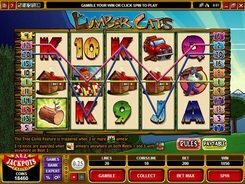 The cats featured in the slot are not your normal pets but lumberjacks who saw wood, carry logs and build wooden huts in the mountains. To fit the theme, the symbols are a pickup truck, lumberjacking cats, trees, etc. Even playing card icons used in the game are styled as if made of wood. A coin size varies from $0.01 to $0.25, with a maximum of 20 coins permitted per line, which translates into a betting range of $0.01 to $100 per spin. The maximum fixed jackpot is 6000 coins awarded for lining up five wild symbols depicted by Lumber Cats. The slot has two different scatters. The Log symbol landed on reels 1 and 5 at a time triggers five free spins. The Tree symbol scattered anywhere on the reels activate the Tree Climb feature. In the bonus feature, you are to choose one of the three cats who you think will climb the tree faster. If the cat of your choice wins, you get a generous cash award. If your cat loses, you are given a consolation cash prize. PLAY FOR REAL MONEY!